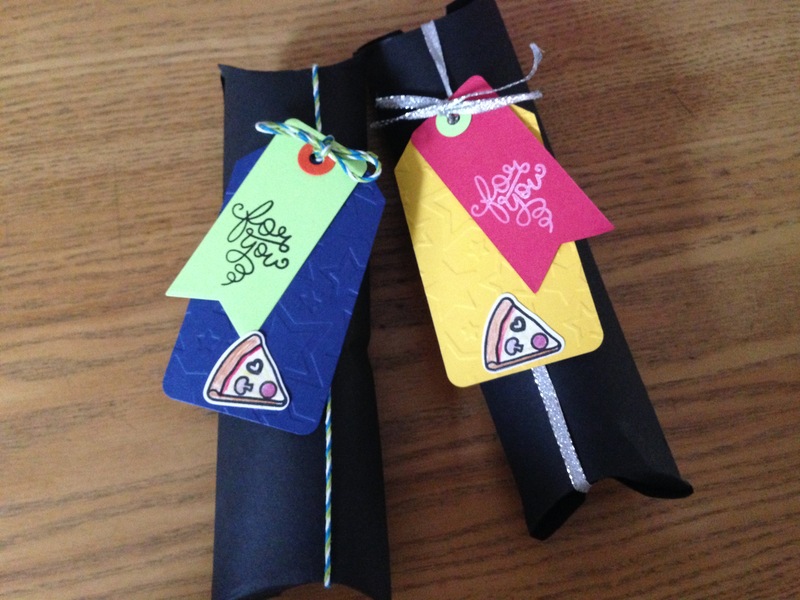 These are the party favors for my daughter’s pizza birthday party. 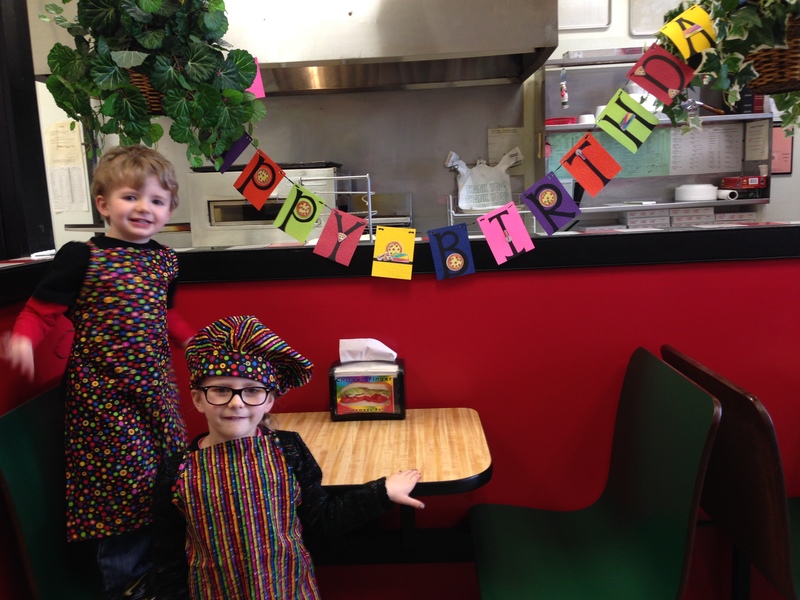 I made each child an apron to wear while they were making their pizza. My daughter picked out two fabrics that coornidated nicely. 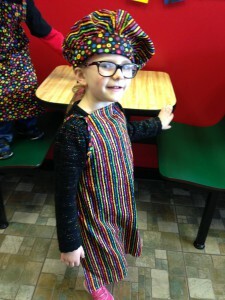 These fabrics helped to decide the colors for the party. 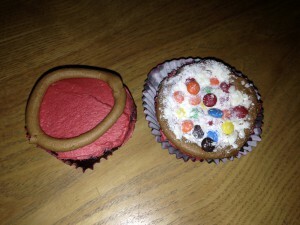 Instead of a birthday crown, I made the birthday girl a baker’s hat. This is the banner for my daughter’s pizza birthday party. Extra Details: I cut each panel from a variety of colored cardstock. Each panel was dry embossed with a Darice star embossing folder. All of the letters were cut out of black cardstock on my Cricut machine. 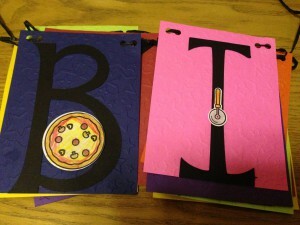 After adhering each letter to a panel, I added a pizza image to keep with the theme. 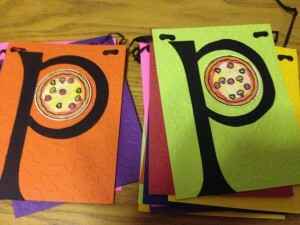 My daughter colored all the pizzas using colored pencils. When I updated my blog in February 2016, I lost all the posting I had already done. I am doing my best to put the posts back up but I do not remember all the details for each card. Unfortunately, the details for this card may be a bit scarce. These are the goody bags for my daughter’s pizza birthday party. Extra Details: I cut both tag shaped out of a variety of card stocks. I dry embossed all the large tags with a Darice Star embossing folder. I stamped the sentiment on the smaller tags. The ink color depended on the color of the tag. Then, I layered one large tag, one small tag, and one hole reinforcer and tied them around the pillow boxed. I used whatever ribbon or twine I could find in my house. I added a pizza slice as a finishing touch. 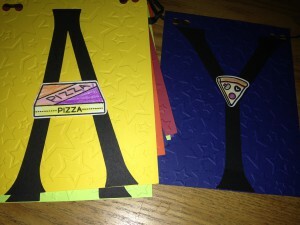 My daughter colored all the pizzas using colored pencils. 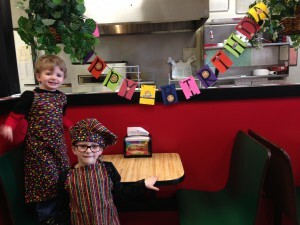 My daughter is having a “Make Your Own Pizza” Party at our local pizzeria for her birthday. 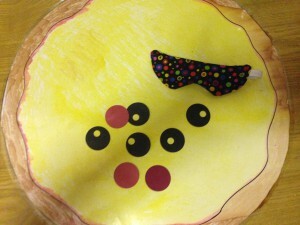 Each child will get to make and eat their own pizza while at the party. These are the Thank You cards that my daughter sent out after her party. Extra Details: I had a lot of odd shaped pieces of card stock left over from making the pillow boxes for the favors and other party decorations that I wanted to use. The actual card base is 4.5 x 5”. 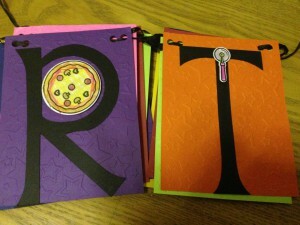 I added the dry embossed colored card stock to bottom edge to bring it to a standard A2 size card. 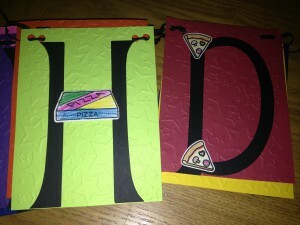 I used a Darice Stars embossing folder on the colored pieces. 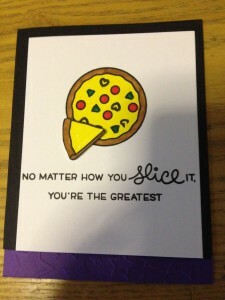 I added a white panel to the front of the card with the stamped sentiment and large pizza. There is also a white panel on the inside that my daughter used to write her thank you message on. 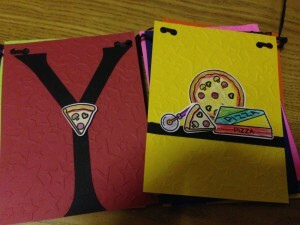 Lastly, we added a slice of pizza to the card front with some foam squares. I actually colored this card with my kiddos’ Crayola markers. My daughter colored some of the Thank You cards but not this one. 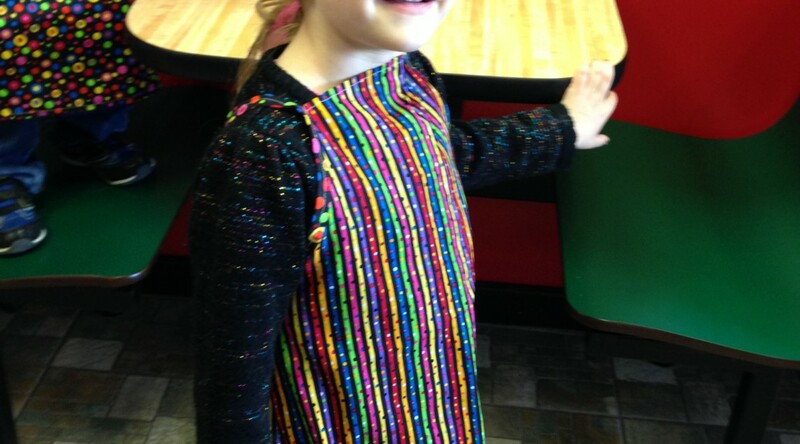 My daughter is having a “Make Your Own Pizza” Party at our local pizzeria for her birthday. Each child will get to make and eat their own pizza while at the party. We needed something for the kids to do while waiting for the pizza’s to cook. 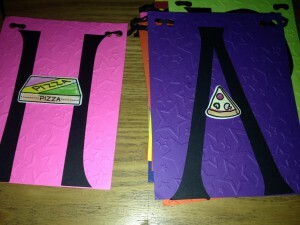 I made a Pin the Topping on the Pizza Game. 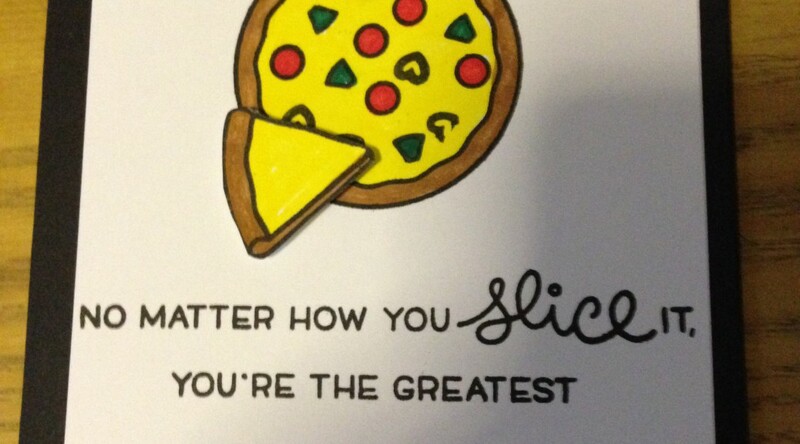 The “toppings” were cut from colored cardstock using Lawn Fawn’s Pizza My Heart and Tag You’re It Dies. I only made olives and pepperoni because they were the easiest and the birthday girl’s favorites. I used masking tape to have the toppings stick to the big pizza. I also made an eye mask with a scrap of the apron material and some elastic.